There are many beliefs associated with this temple, which are too hard to believe. Let’s take a look at what these beliefs are! 1. 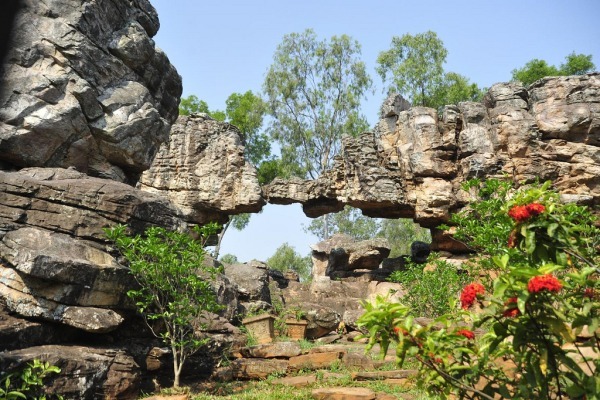 The Arch at the entrance of Tirumala Hills, which resembles the hood of a serpent is considered unique in the world. 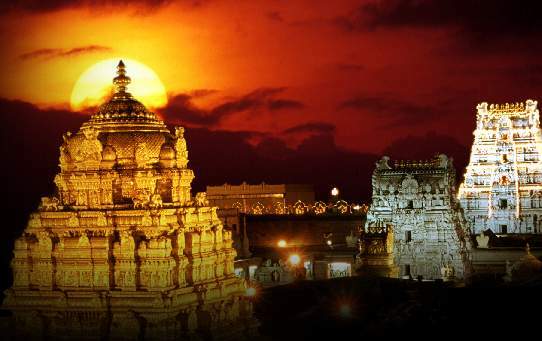 It is said that main deity in Tirumala temple is of the same height as the height of the Arch. Lord Vishnu is said to have put his first foot down at a place called Padalu, which is the highest point of Tirumala hills, Second step at the location of the arch and the next step is stated to have been placed where his idol is now worshipped in the temple at Tirumala. 2. At the entrance of the main door (Mahadwaram of the temple), to the right side, a stick which was used by Ananthaalvar to hit Venkateshwara Swamy is present. 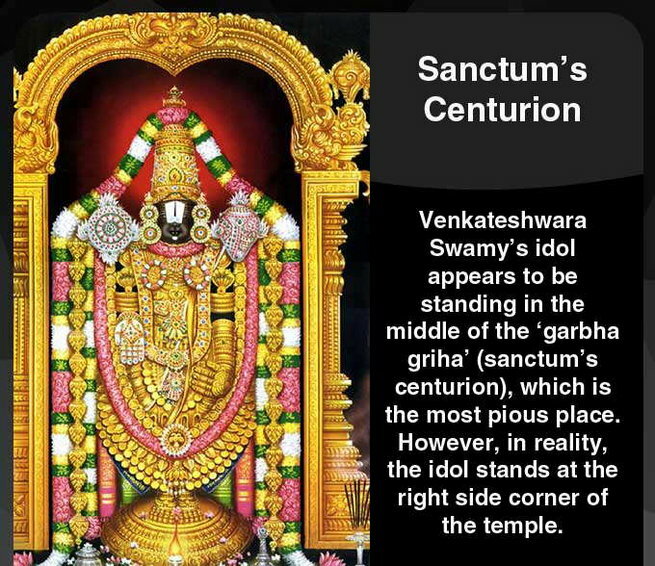 Ananthatalvar hit Lord Venkateshwara Swamy on the chin when Swamy was in his childhood, which oozed blood. 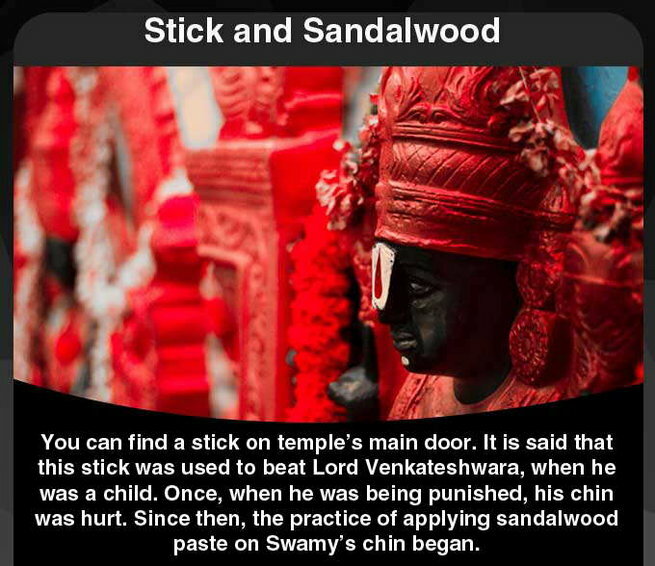 Since then, the practice and tradition of applying sandalwood paste on Swamy’s chin came into existence. 3. 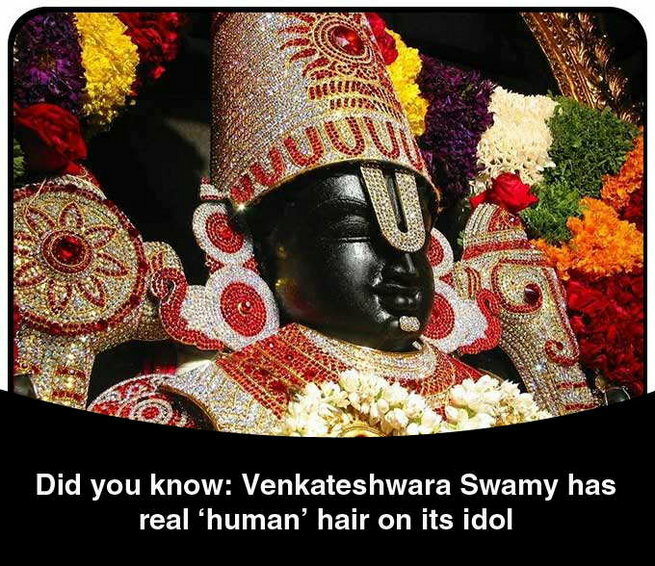 It is said that there is real hair on the main idol of Lord Venkateshwara Swamy and they say that this hair is always silky smooth and never tangles. When Balaji lost a small portion of hair after hit by a shepherd, Neela Devi a Gandharva princess cut a portion of her hair and implant it on his scalp. Lord Balaji promises her that all his devotees who come to his abode should render their hair to him, and she would be the recipient of all the hair received. 4. A Chemical kaccha Karpooram (Green Camphor), a soft white chemical is applied on the idol of Balaji every day. The fact is that, if this chemical is applied on a granite stone, cracks will appear on it. 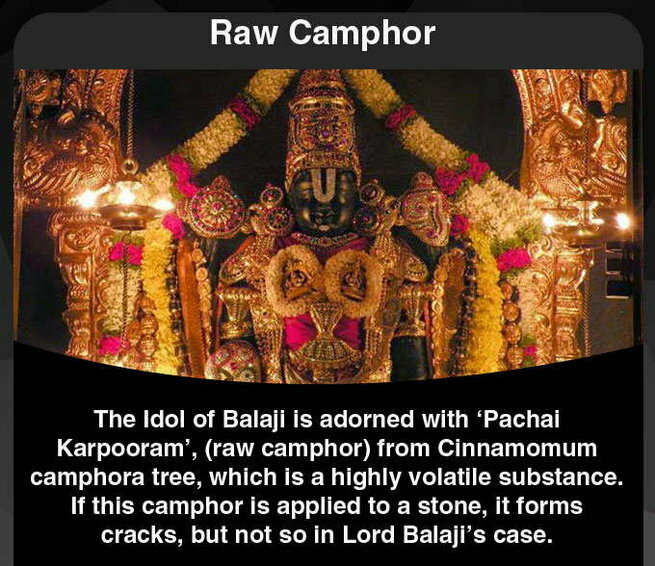 But surprisingly, even this is applied on Balaji every day; there is no damage to the stone. 5. There is a secret village, approximately 23 Kms from the temple in Tirumala, where no one is allowed except the residents of the village. The people are said to be living with strict practices and tradition. It is from this village, that all the flowers, milk, ghee, butter are sourced for the God. 6. When someone dies how one does not see behind and lights the fire, similarly, the flowers removed from Swamy are thrown in the water fall at the back of Swamy. It is said that the pujaris do not look at the back of the Swamy that entire day. 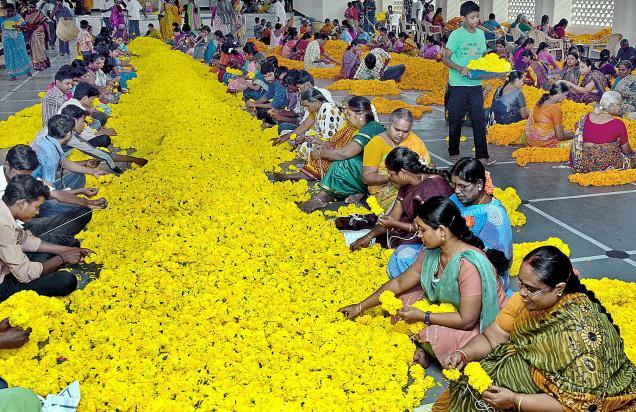 All these flowers can be seen floating at a place called Verpedu (located on the way to kalahasti) which is 20 km from Tirupati. 7. Lord Venkateshwara statue appears to be standing at the center of the Garba Gudi. But, actually, Swamy stands at the right side corner of the Garba Gudi. This can be noticed from standing outside. 8. No matter how many times, the back of Swamy is dried, it always remains wet. If you carefully keep your ear and listen against Swamy’s back, sound of an ocean is heard. 9. 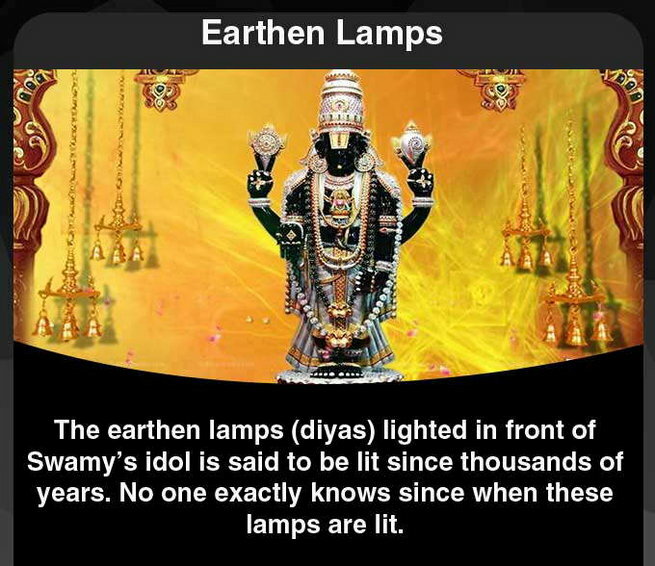 The oil lamps lighted in front of the Swamy idol are said to be lit since thousands of years. It is also said that they never ever put off and no one exactly knows since when these lights are lit. 10. During 1800’s, the temple was said to be closed for 12 years. One King of that time is said to have punished 12 people by killing them and hanging them on the walls of the temple for doing the unsacred thing at the temple. They say that it was at this time that Vimana Venkateshwara Swamy has come to existence. 11. 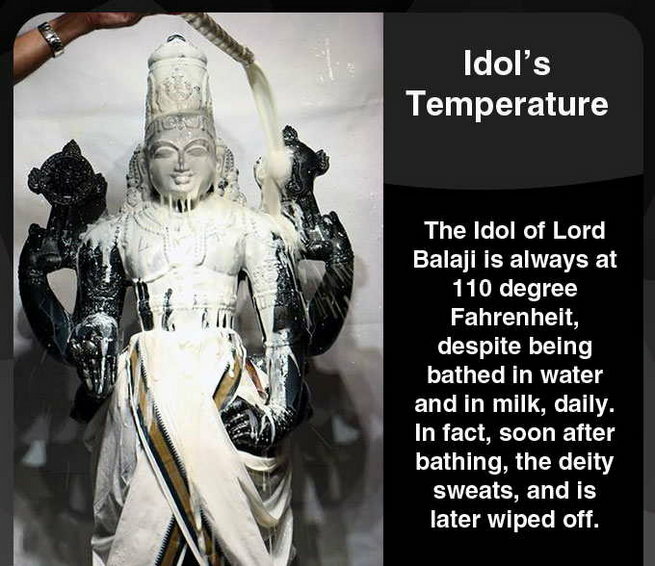 It is said that the idol of Balaji always maintains a temperature of 110 degrees F. But the temple is at a height of about 3000 feet so the climate is normally cold. 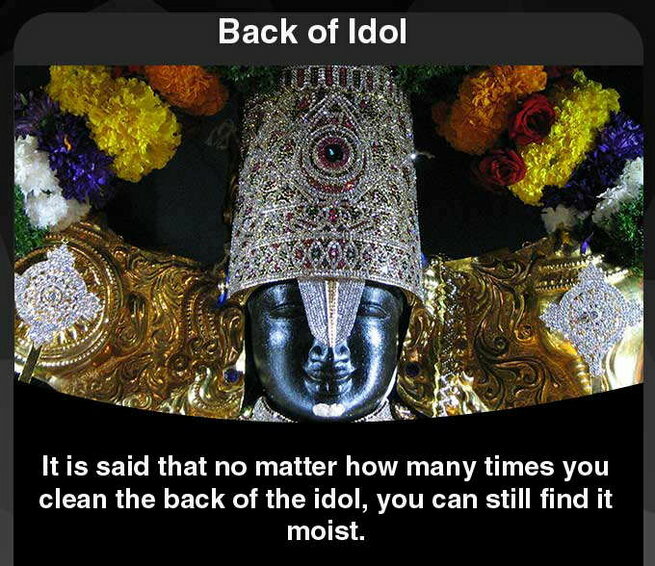 It is also said that every morning at 4: 30 am after the Abhishekam is done with water, milk as well as other dravayam, sweat appears in the orm of fine water particles on the body of the idol, which is wiped off with a silk cloth. On every Thursday when ornaments are removed before sacred bath it is noticed that they are warm. 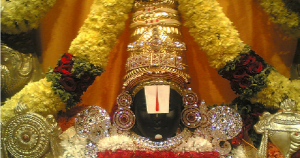 There is also a traditional belief in vogue that Balaji has a third eye which he opens at the time of Abhishekam.